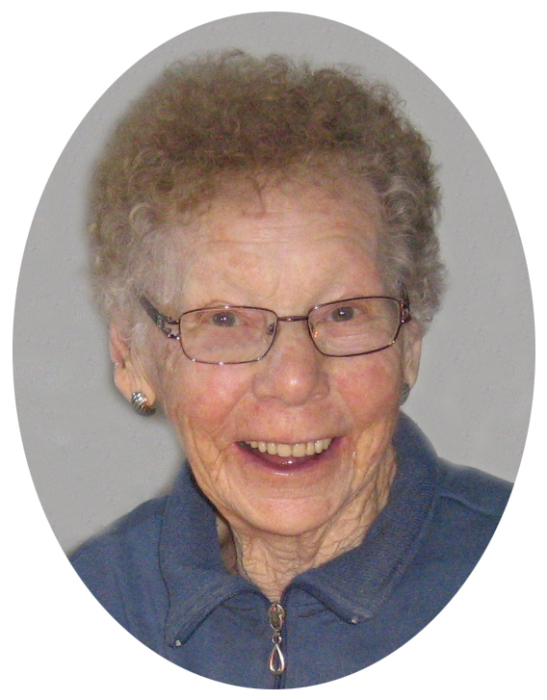 Gladys Crawley (neé Lake) passed away on May 15, 2018 at Rose Villa in Rosetown, SK. She was predeceased by husband Wallace in 2002, infant son Gary in 1966, son-in-law Jamie Fowlie in 2016 and her parents William and Ada Lake. She is survived by daughters Joan (John) Shorrock of Heritage Pointe, AB and Darlene of Calgary, AB; son Owen (Lynn) of Harris, SK and grandchildren Brianna and Cameron Shorrock and Shae Crawley. Gladys was born on a farm NW of Asquith on April 7, 1921 during a blizzard, the eldest daughter of seven siblings. She grew up on the farm and attended Grainge School. She attended Normal School in Saskatoon obtaining a teaching certificate. Her twenty year teaching career took her to several rural one-room country schools. On July 14, 1959, Gladys married Wallace Crawley of Harris, SK. Mom joined Dad in a farming career and raising a family of four. Unfortunately a young son, Gary passed away. In Mom’s recent words “something you never get over but you made the best of it and life goes on”. Mom had saved during her teaching career and bought a quarter section of land when she moved to the Harris area in 1959. She was very proud to be a landowner. Mom had always said after a youth of tending, milking and chasing cows and struggling to harness horses that she would never marry a farmer…how things change. On the farm, mom raised chickens, turkeys, ducks and geese and sold eggs and milked and fed cows. Mom was always at Dad’s side during seeding and harvest. She prided herself on being punctual. Dinner was always at 12 noon and supper at 6 sharp – whether she was serving it in the house, at the dining table or to the seeding and harvest crews in the field. Mom and Dad semi-retired in 1978 and moved part-time to Saskatoon. Mom, not able to sit still, worked part-time at the bus depot, Bonanza Steakhouse and Ponderosa Steakhouse. Mom was a long-time member of the Hillview Willing Workers, enjoying the meetings with the local ladies and contributing to the fundraisers. In 1999, Mom and Dad purchased a new house and had it moved to the farm at Harris, SK. After Wallaces’ passing in 2002, Mom remained on the farm enjoying the new home, her garden, her flowers and her special companion – Laddie, her Border Collie dog. In June 2016, Mom moved to Rose Villa Long Term Care facility in Rosetown, SK where she resided until the time of her passing. The Funeral Service was held at 1:00 p.m. on Saturday, May 26, 2018 at the Harris Community Centre with Mrs. Diane Schmidt officiating. Donations in memory of Gladys may be made to the Harris Cemetery Fund, P.O. Box 124, Harris, SK, S0L 1K0 or Harris Community Centre, P.O. Box 124, Harris, SK, S0L 1K0.